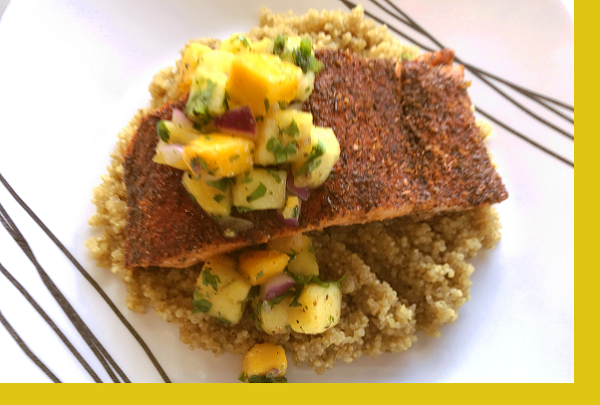 Savory blackened salmon baked then topped with a sweet mango pineapple salsa and served over healthy, protein packed quinoa. Hassle free, fresh and colorful weeknight dinner the whole family will enjoy. Preheat oven to 425 degrees. Unbag and place the salmon in supplied pan and into the oven. Bake uncovered for 20 minutes or until cooked to desired doneness. Reheat quinoa. Serve with fresh mango pineapple salsa. What a delicious and healthy meal. 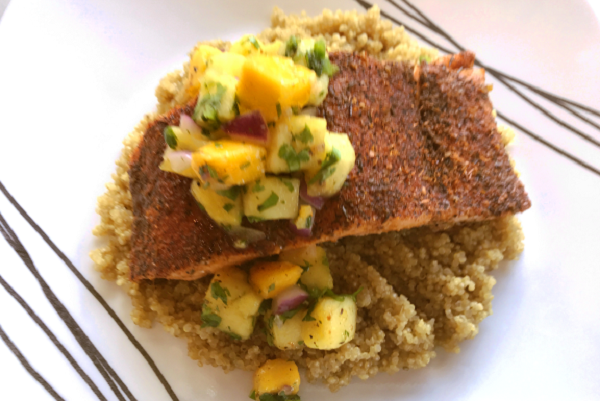 Baked salmon with mango salsa served with quinoa. Never tasted before a mango salsa. Unique ! Thanks Maria. We loved the flavor. This has become a new favorite at our house. Nicely seasoned, fresh and balanced!